- videos, photos, audio, URL/web pages and PDF. 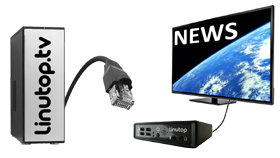 From any computer login to your online Linutop TV account. Click on "Add" to add an item from your computer to the library or to create a page especially for your digital signage thanks to the pre-edited HTML templates at your disposal. Organize your files and programm their display time. - And the display duration. Connect your players to your Linutop TV account and display your content. 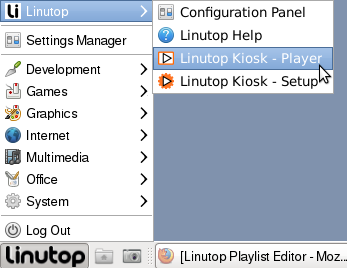 Configure the Linutop Kiosk software to launch automatically your playlist on start. Connect to your Linutop TV account through the "Linutop Configuration Panel" with your invoice number and your email. 1. Connect a "player" to each of your screens. Each of these "players" can be a PC or Raspberry Pi under Linutop OS, or a mini PC Linutop (XS / 6). Download now Linutop OS on your PC or raspberry Pi for free ! IV - check Linutop TV Server and identify yourself with your invoice number and your email. * If the tab is grayed out, go to the "General" tab and check "Digital Signage Player". II - Linutop Kiosk - Launcher. Linutop Kiosk Player is included in Linutop OS, and is available for PC and Raspberry Pi. Once put in a playlist, the video will be played automatically until its end. Display pictures, photos and all types of images on your screens. You will be able for example to screenshot with the "Print Screen" touch and the modify it with your usual image edition software (paint, photoshop,...) and then insert it directly in one of your playlists. Linutop.tv can be used as a powerful sound broadcast system. A shuffle function is available to play elements randomly. One other feature is that if you programmed a message to broadcast at a certain time of the day, it will not interrupt the music and will be played at the end of the current song. If the URL isn't available on the network, the player will automatically play the next element in the playlist. On Linutop Kiosk, you have access to the Autoscrolling, a new feature that will slowly scroll down a web page back and forth on your display screen in order to show it entirely. Web pages can be zoomed to fit your screens. On each of these slides you will be able to change easily (without writing any HTML code thanks to our interface, yet it is still available if you want to modify it directly) the logo, the background and the text message. 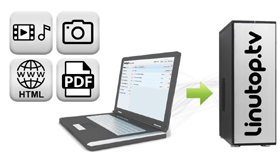 Display your words, Excels, powerpoints... documents in PDF format on your screens. "File" ➜ "Save as" ➜ change format to ".pdf" ➜ "Save". "File" ➜ "Export to PDF Format" ➜ "Export". 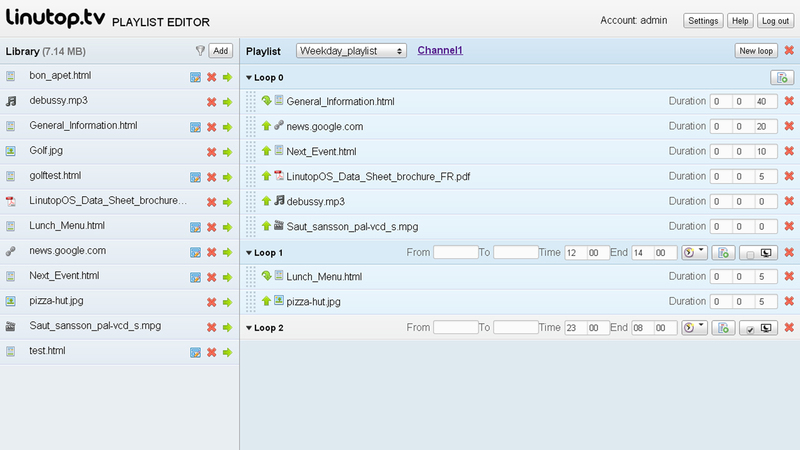 Click on the "Add" button in order to upload your document on the Linutop.tv server. It will then appear in your library. ➜ For a calculation page, be sure to set a good dimension for your pages in order to have the best rendering possible. To see where your pages stop, you can go in the "display" tab and go to "display page drops", then you will be able to edit/move your pages for your needs. 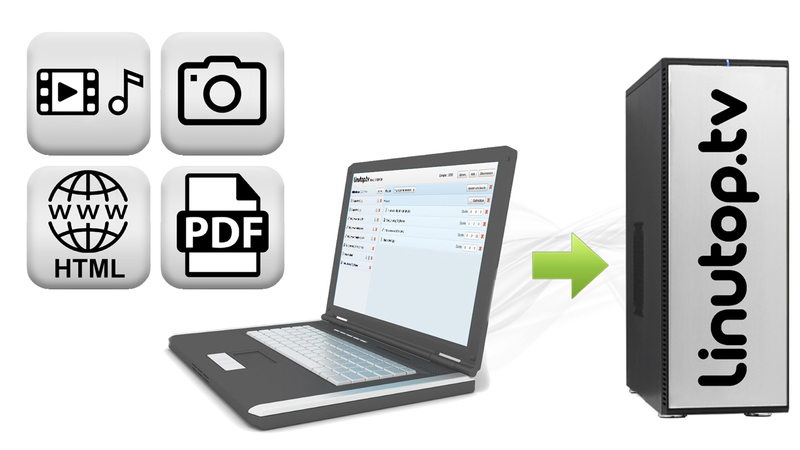 The scrolling of the PDF pages is automatic and is determined for each page by the duration of display. - Local, the server is not connected to the internet, it is therefore totally private, the server and the players must be connected to the same local network. - Cloud, the server is available via the Internet, extremely flexible because the display can be changed from a computer and internet access. Linutop TV enables to edit and broadcast playlists online. It allows to realize playlists from your own medias and broadcast their display on your screens, continuoulsy with a low energy and bandwidth consumption for a simple and efficient communication. Once your playlist is activated Linutop Kiosk locally manage to diplay it on your screens. This software is included in Linutop OS. Linutop OS is an operating system based on Ubuntu and optimized by Linutop. 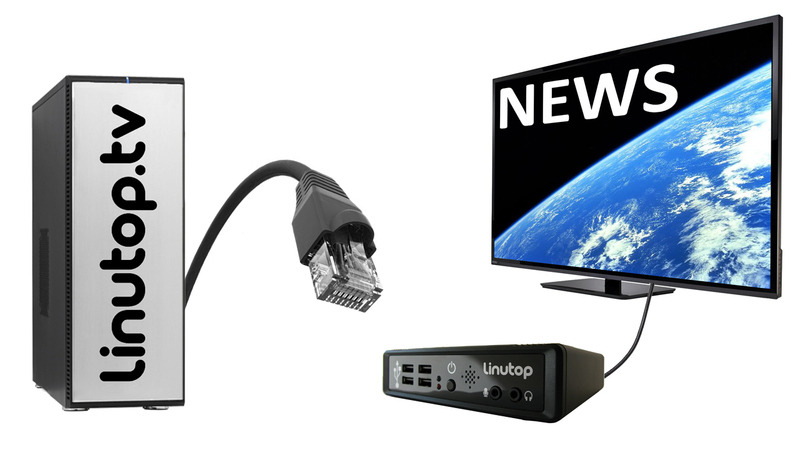 Once configured, your screens will automatically display contents of your Linutop TV account.